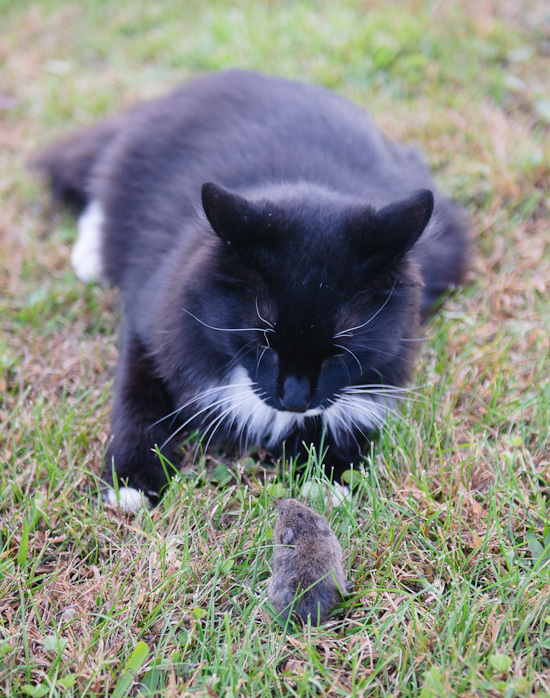 I took this photo of my kitty Leo and a mouse a few days ago. Looks like they’re deep in conversation, doesn’t it?! Diplomacy vs. Instinct. what a moment to capture! Great shot! I love Leo’s white whiskers :). Awwww… That’s so cute. You’re lucky to capture such a moment! What a shot! I want to know what happened AFTER their conversation! Your cat looks much like ours and he also likes mice. However, he doesn’t usually seem to have many conversations with them. He does often wonder why they won’t get back and play with him though :) Such a cute pic!! ha what an incredible shot. I love it. Deep in conversation for sure but how long before it’s one-sided LOL. Great photo!